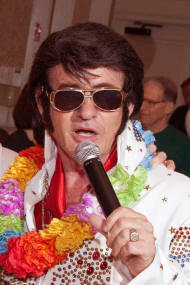 Keith Coleman is one of the best Elvis Impersonators in the Country. 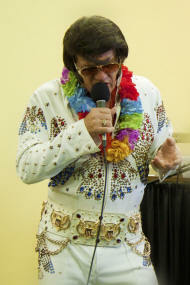 He has performed his Elvis Tribute show to Sold out crowds throughout the United States and Europe. 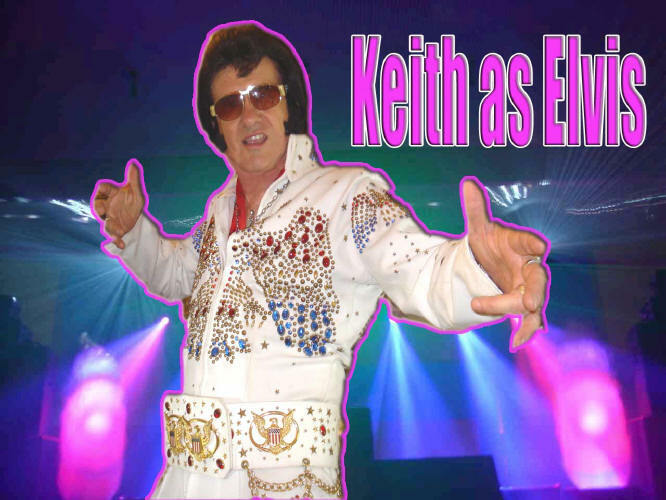 Keith can make any event special. No matter if its a backyard birthday party with 20 guests or a 5000 seat concert hall you can rest assured you have hired the best money can buy. 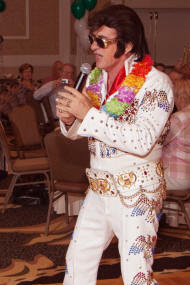 Keith Coleman has performed his tribute to Elvis all over the country to standing ovations. It was voted the best Elvis Show in Florida for 13 Years in a row. 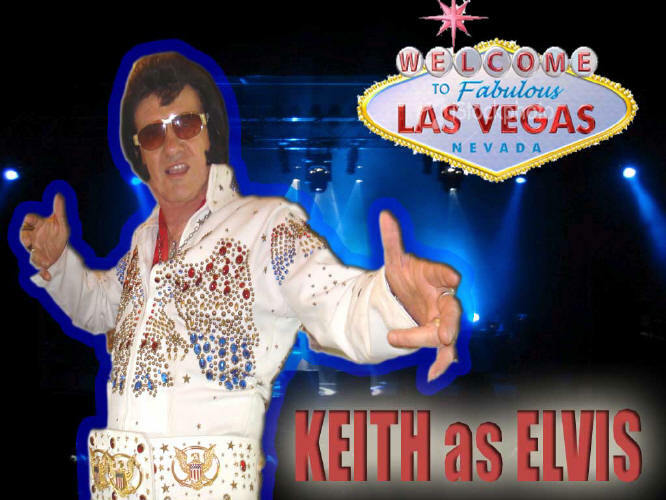 Keith has performed for the Las Vegas Revue, Hollywood on Tour, Legends, Faux Superstars, American Superstars on Tour, and more. 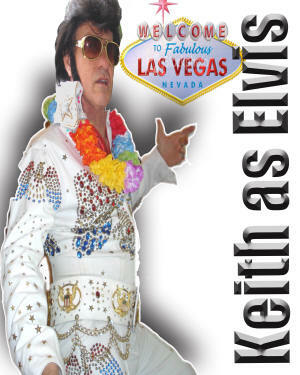 The Las Vegas Revue is a high energy stage production comedy impersonator show featuring Ruby Tuesday and Keith Coleman. The show is completely self contained. with state of the art sound and lighting. The Las Vegas Revue is an impersonator show with the entertainment value of " Legends of Vegas " but at a much more reasonable price. 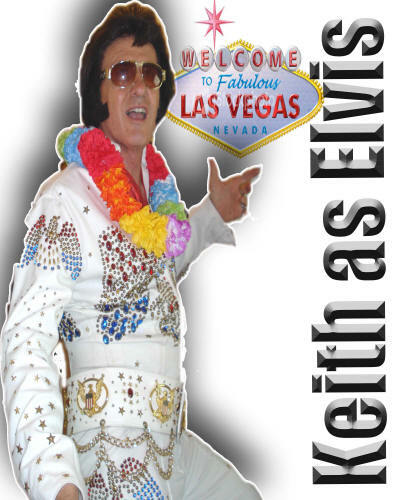 Dolly Parton, Bette Midler, Liza, Barbara, Judy, Reba, Carol Channing, Patsy Cline, Tom Jones, Elvis, Neil Diamond, Willie Nelson, Englebert, Frank Sanatra, Louie Armstrong, Buddy Holly, Fats Domino, Johnny Cash and Little Richard are just a few of the stars you'll see at Keith Coleman and Ruby Tuesday's Las Vegas Revue Show. They pull out all the stops in this hour and a half extravaganza of light and sound that will leave even the biggest skeptic begging for more. 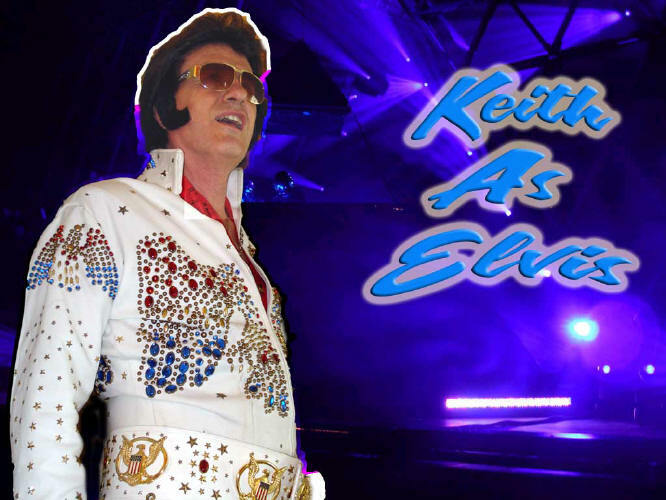 Keith and Ruby have toured extensively in the United States and Europe. 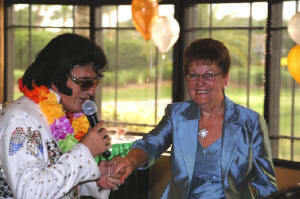 They performed their Las Vegas Revue show six nights a week at the Holiday Inn on St. Petersburg Beach for 13 years. Here they were voted the longest running show on the Suncoast. 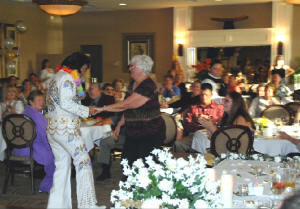 They later performed for Holland America in Europe for 6 years touring the coast of France, Italy, Spain and Greece. They also performed their show for two seasons in the Branson styled Goodtimes Theatre in Indiana. 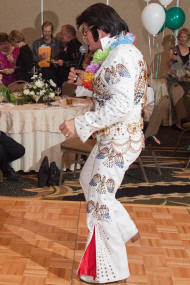 Available for Birthday Parties, Weddings, Active Adult communities, Corporate Events. 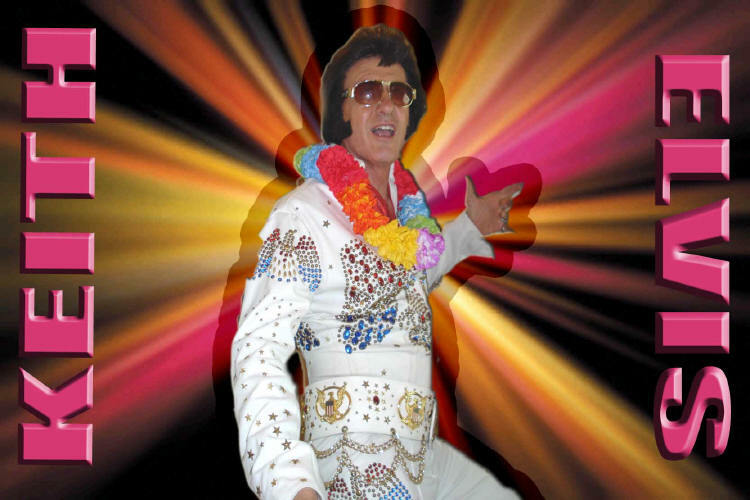 It’s incredible that the King’s legacy lives on even thirty years after his death. 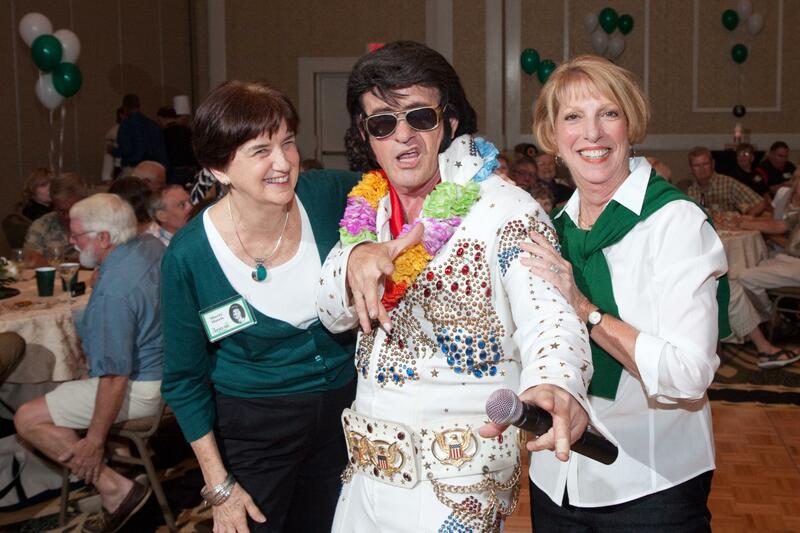 The popularity of the King, that has sustained this line of work, is beyond comprehension. 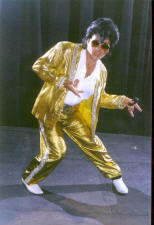 Each tribute artist puts his all into every performance. 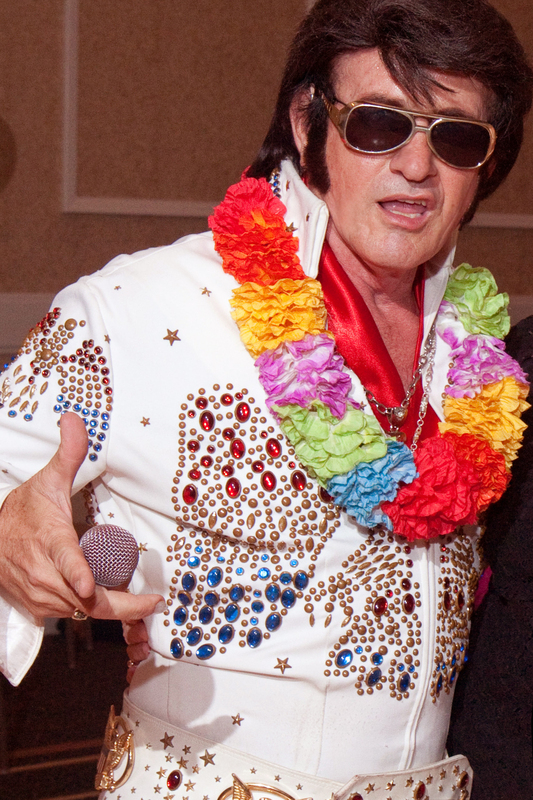 Some people may say that a tribute artist has no identity of his own and is known only by his Elvis impersonation. But what keeps him coming back to it year after year, show after show, is seeing the reaction on people’s faces. He does it because he likes the devotion and adulation he sees on people’s faces. 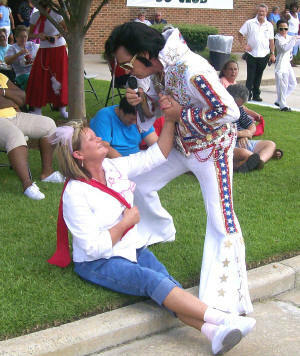 He does it because of his like for Elvis and his music. 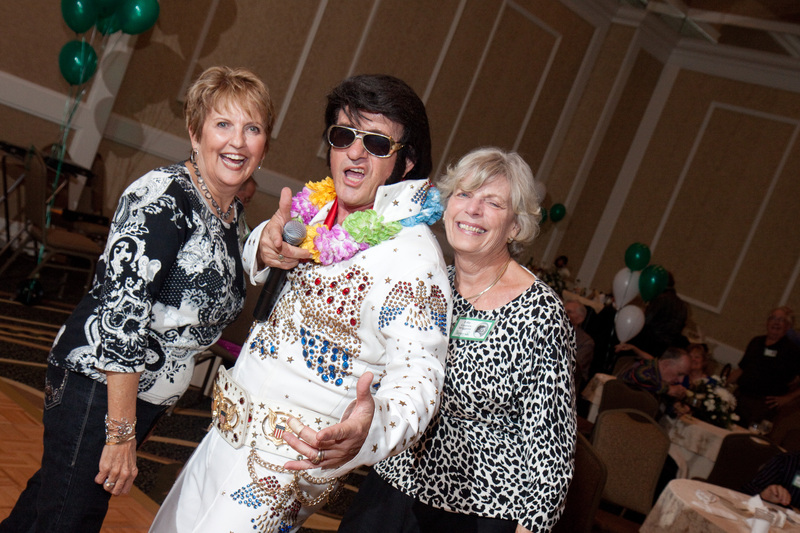 What could be a better tribute to Elvis? 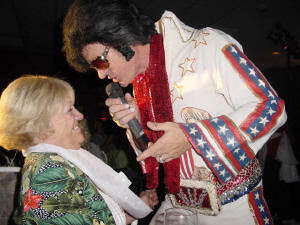 Anyone who has ever attended an Elvis tribute show in Las Vegas will testify to the excitement and exhilaration that pervades the performance venue. These shows are a sincere attempt to capture the right essence of the king, and best represent the Elvis legacy. 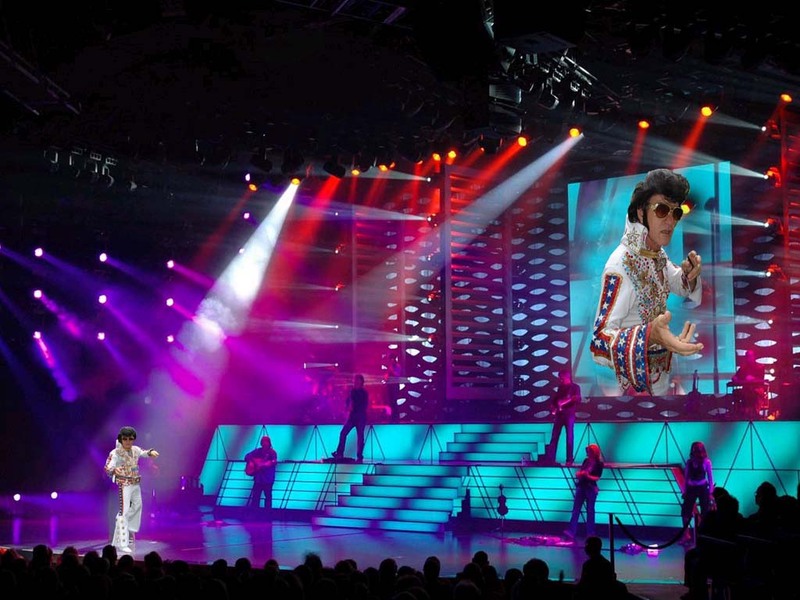 In keeping with Elvis’s own energized and charismatic performances, an Elvis tribute show is guaranteed to be high energy and very physical. A lot goes into pulling off the perfect act which wows the audience and brings it to its feet screaming with adulation. 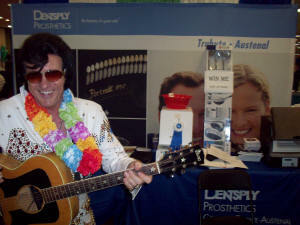 Elvis was never just a voice. It was the whole package of music, look, performance and charisma that had millions of people under his spell for twenty long years. Recapturing all this and more, in front of a critical audience, requires a special effort. Getting the look right is not so hard. A lot of manufacturing companies duplicate the authentic rhine stone studded jumpsuits using the original, exclusive designs of Bill Belew and Gene Doucette. 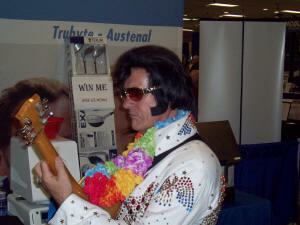 A excellent Elvis wig takes care of the trademark side burns and the quaff. Assorted jewelry on the fingers and around the neck, and the artist is all set to take the stage. 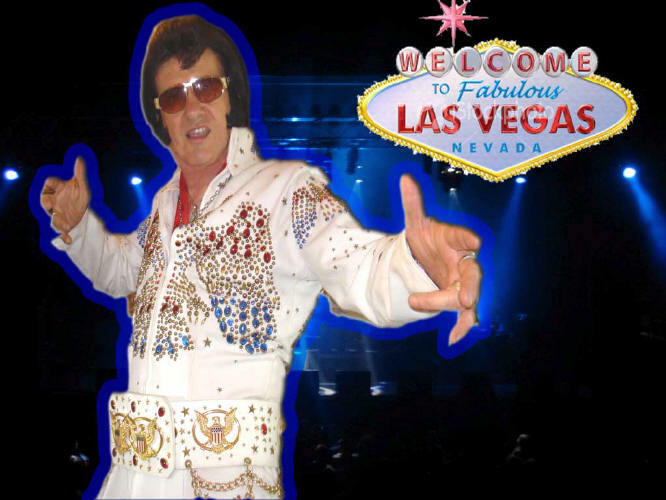 People frequently associate Elvis Impersonators with Las Vegas. Elvis Impersonators, however, can be hired from New York to California and everywhere in between! 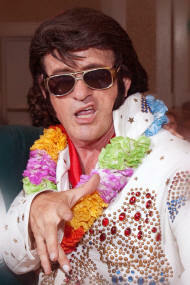 Elvis impersonators have spent years studying Elvis' music and mannerisms. Typically, Elvis look-alikes portray the older Elvis Presley, with the sunglasses, the jump suit, the rhinestones, and the long sideburns. 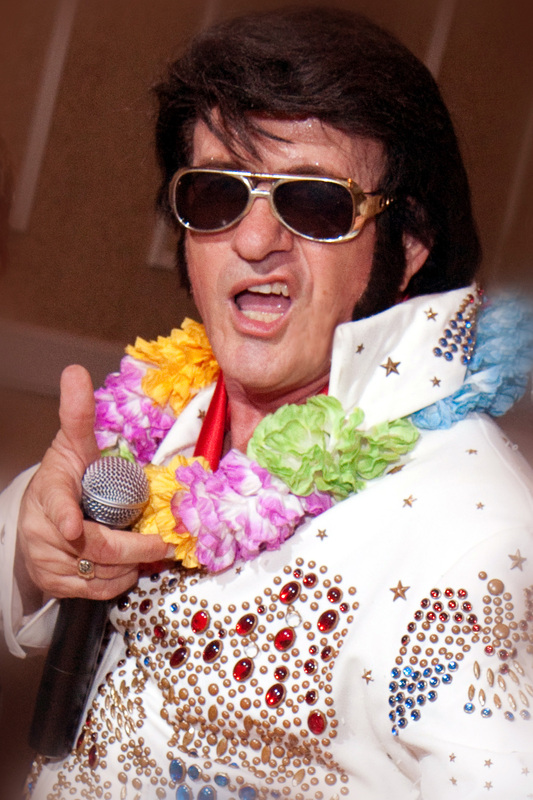 However, you can also find an Elvis tribute artist or Elvis impersonator portraying the younger, more clean cut Elvis Presley of the 1950's. 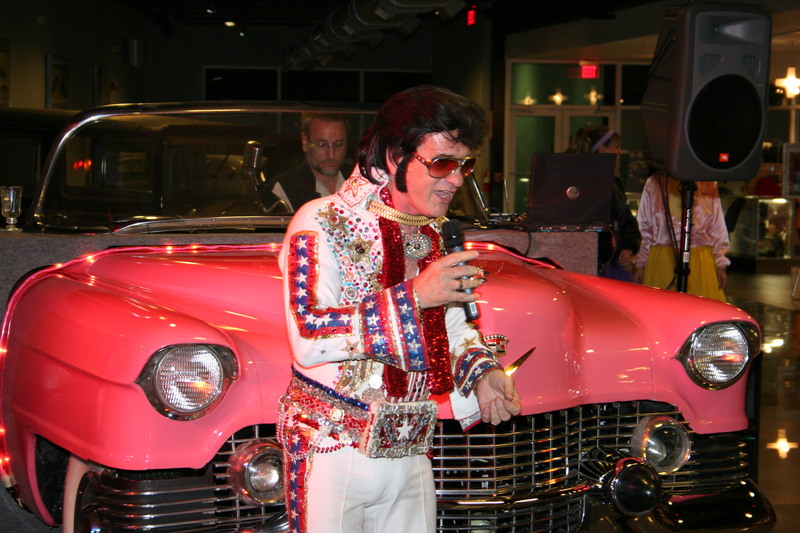 Besides looking like Elvis Presley and dressing like Elvis, most Elvis Impersonators will sing and play like "The King of Rock and Roll" as well. 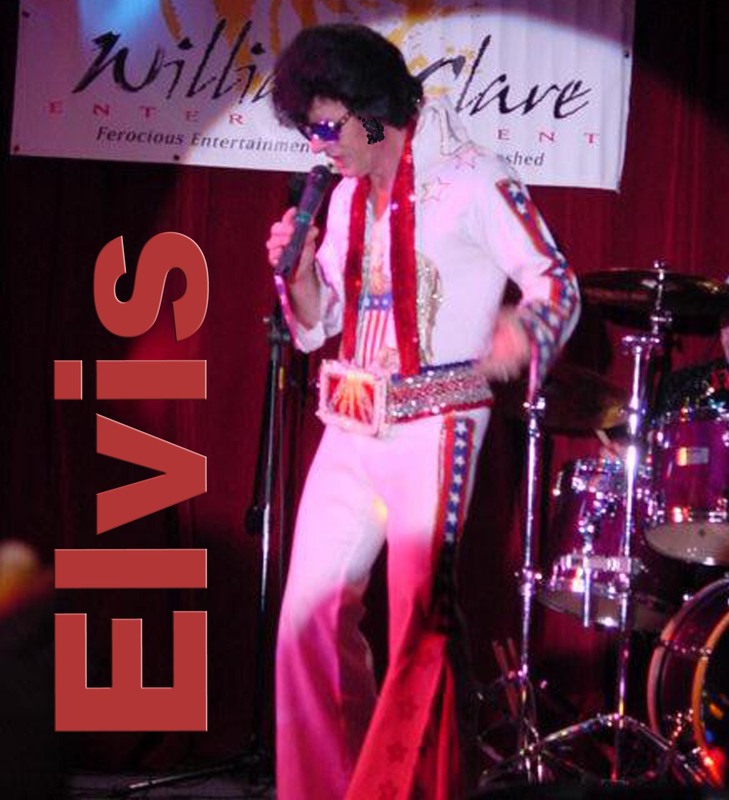 Dressed in authentic Elvis outfits, they will perform the classic Elvis songs including "Heartbreak Hotel", "Jailhouse Rock", "Love Me Tender", "Hound Dog", "Don't Be Cruel", "Blue Christmas", "All Shook Up", "Are You Lonesome Tonight" and many, many more! 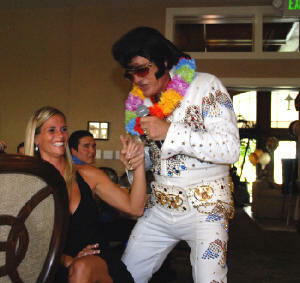 Elvis Impersonators perform at all types of venues including Casinos, Birthday Parties, and Charity Events. 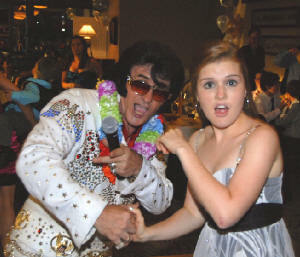 Hire an Elvis impersonator today! Keith Coleman is known for his outstanding 3 1/2 octave vocal range and intonation. You will hear the soul and sound of a legend in every show! He doesn't just sing a song, he sings with feeling. 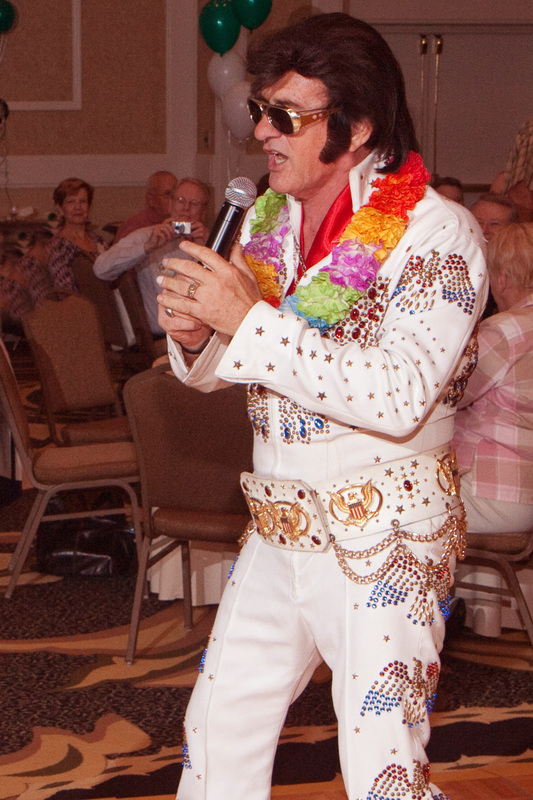 As a full time professional performer, he is available for tribute shows, gospel concerts, Elvis-grams, special events, parties, reunions, carnivals, anniversaries, weddings or store promotions. 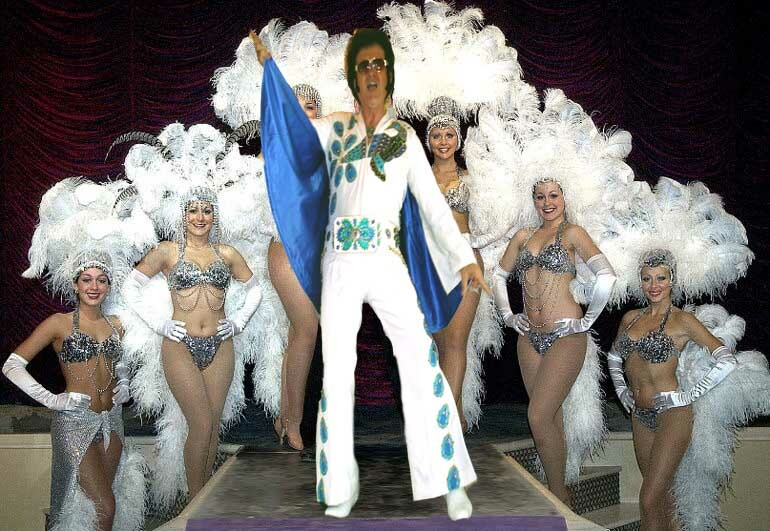 When you search for a Las Vegas Top Impersonator for a corporate stage show or for a tradeshow, you will want to hire the world’s best Elvis impersonator. It is just not about his ability to look like the character or person. 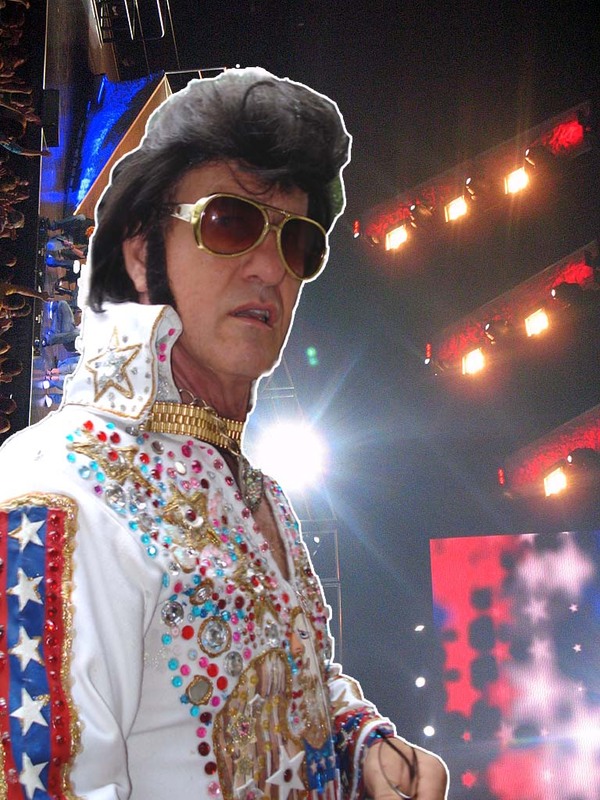 Impersonation can be about becoming that personality on stage. It requires a lot of training and practice. 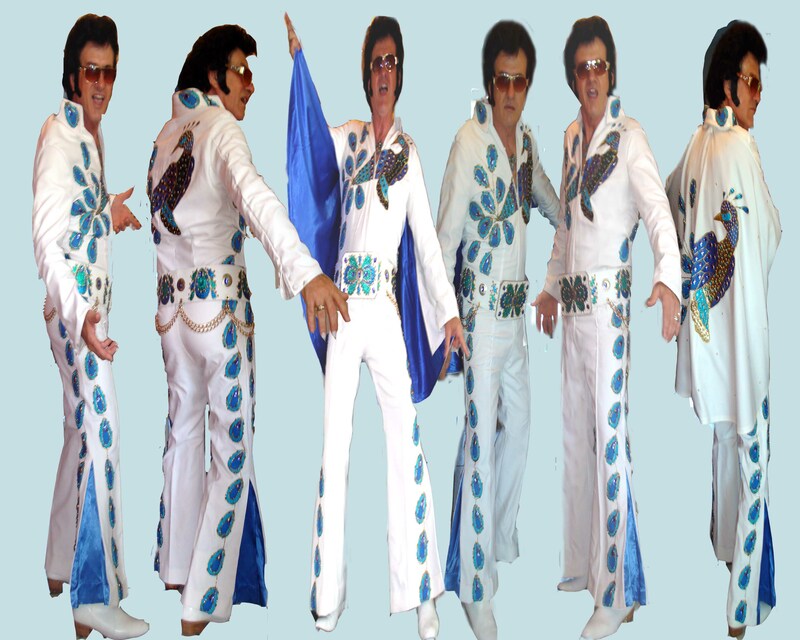 You can easily see the difference between someone who has a lot experience in performing on stage shows and someone just starting out in the impersonation business. Keith's show itself is usually very high energy. The audience is mesmorized. Elvis Impersonator Keith Coleman looks so much like King. 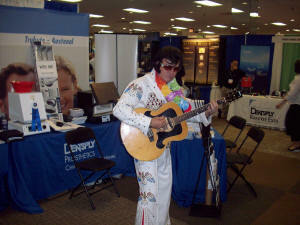 And then the he starts to sing the hits of Elvis’s million selling hits. Elvis Hits like Jailhouse rock, My way, Heartbreak Hotel, Blue Suede Shoes, CC Rider, Suspicious Minds the audience goes crazy dancing to the foot tapping music. 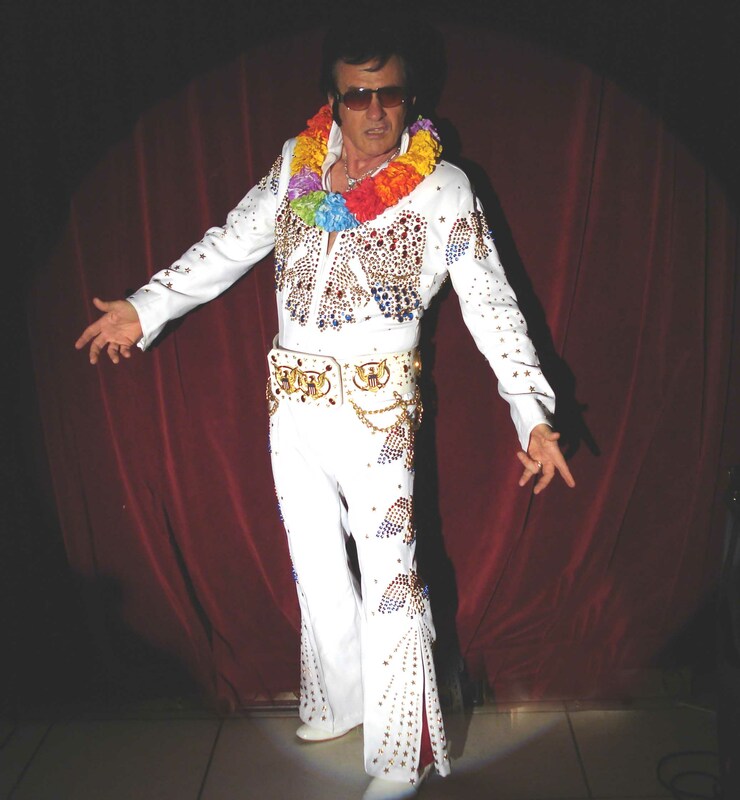 Most tribute shows prefer to have Elvis as the final act at the end of the show, since Elvis is so popular. The crowd reactions can be funny to watch. Some people actually feel that the character is on stage. 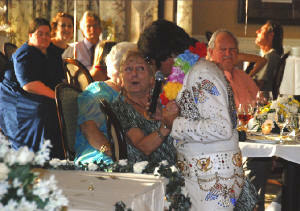 Some members of the audience get stage struck. 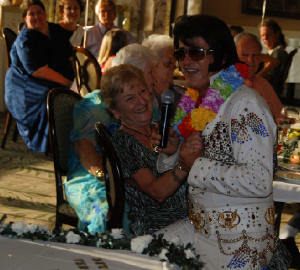 Others are even drawn to tears when they see the Elvis. 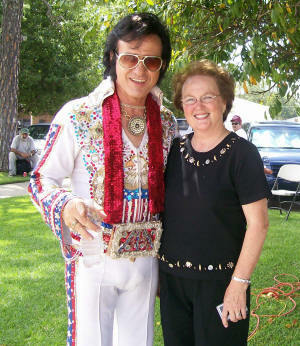 It’s amazing that Elvis’s legacy lives on even thirty years after his death. 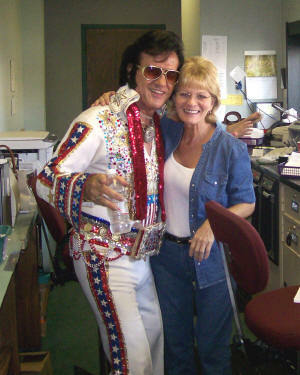 The popularity of the King, that has provided this line of work, after all these years. This Elvis tribute artist puts his all into every performance. 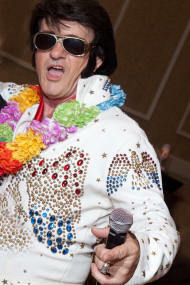 Some people may say that an Elvis impersonator has no identity of his own and is known only by his impersonation. This is often a misconception. 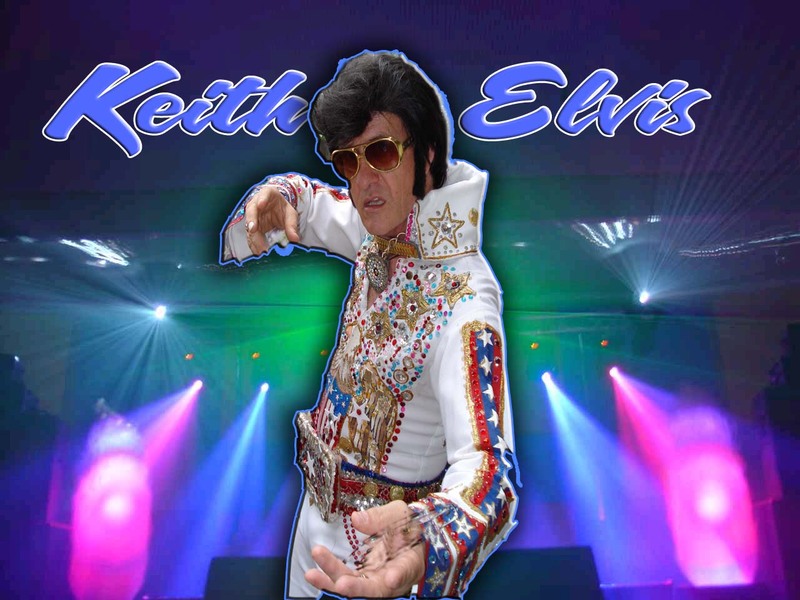 Keith has enjoyed being and Elvis Impersonator and Tribute artist all over the world. Keith believes Elvis was the King of Rock n Roll. 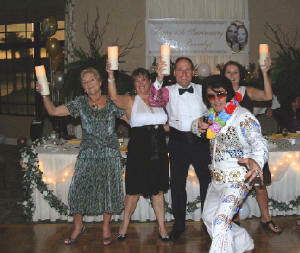 Find a wedding planner, videographer, or photographer in our online party store. 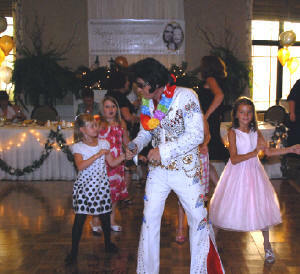 We have ideas for your wedding, birthday, reception and party event. If you hire Keith Coleman and Ruby Tuesday and their Las Vegas Revue show you are investing in their 20 years of experience to make your function a success. 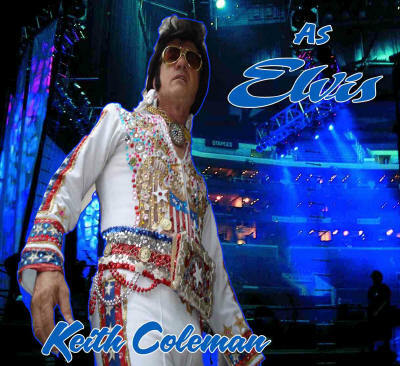 Keith Coleman's Tribute to Elvis is a show that would make the King of Rock and roll Proud. 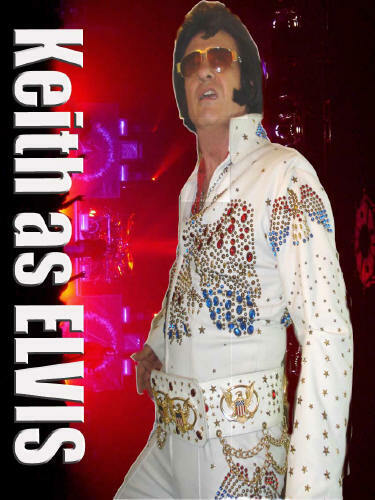 Keith has performed his Tribute to the King all over the United States and Europe. Ruby's impersonation of the living country Legend Dolly Parton is truly Amazing. 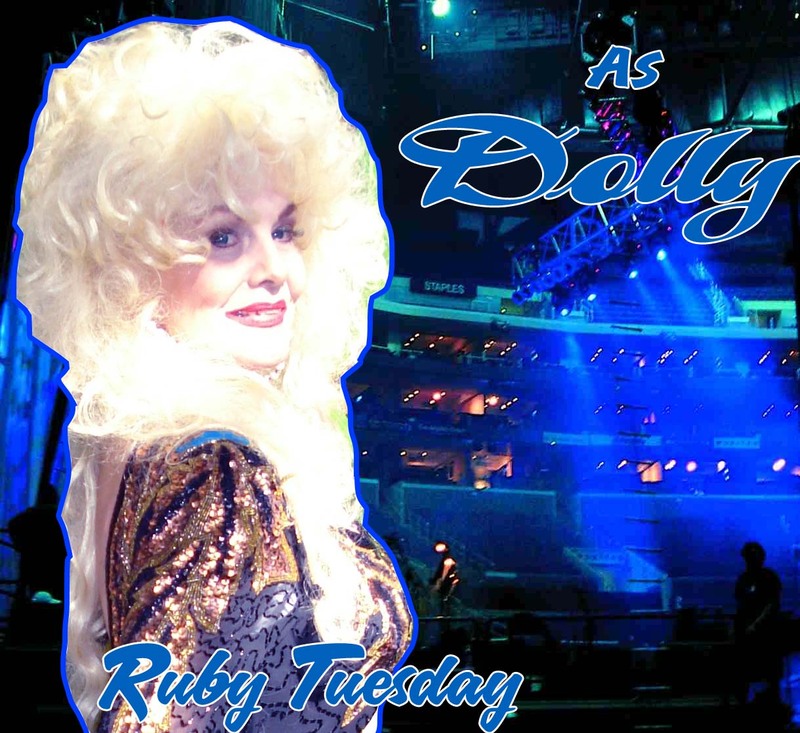 She is one of the top three impersonators doing Dolly in the Country. 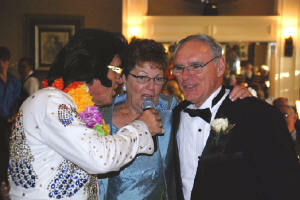 How about a Tribute to the 1950's with Ruby and the Tomcats. Maybe your taste is more into country music. 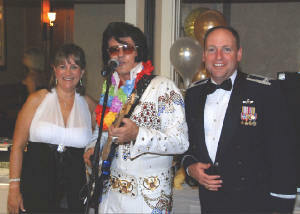 In that case we have our Tribute to Patsy Cline and our Tribute to Johnny Cash. 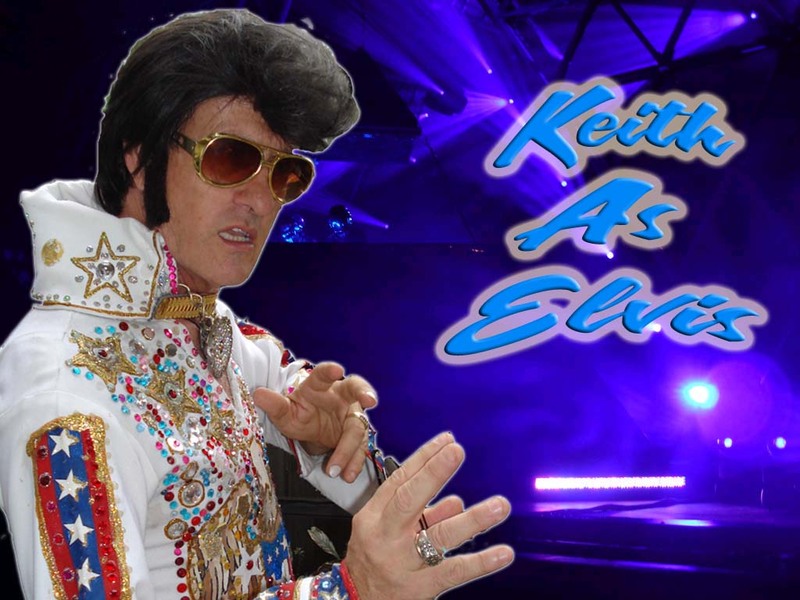 Keith was chosen the best Johnny Cash impersonator in the United States by the ABC television show The Next Best Thing. If that's not enough country for you then climb on board for the Legends of Country Music with impressions and impersonations of over 15 country Legends. 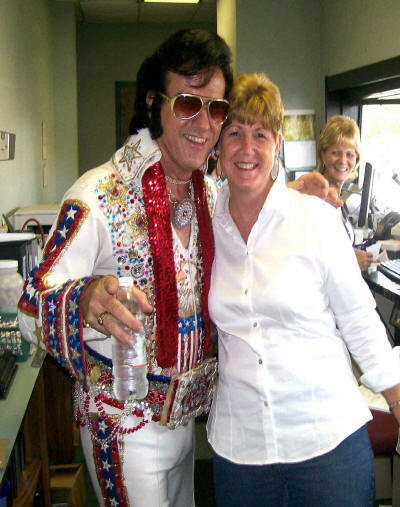 If you would like a show with a little less Nashville and a little more Las Vegas then check out our Neil Diamond and Barbara Striesand Show. 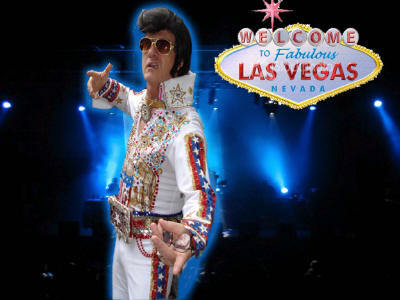 We take Las Vegas to the max with our Tribute to Elvis. The King is alive and well. 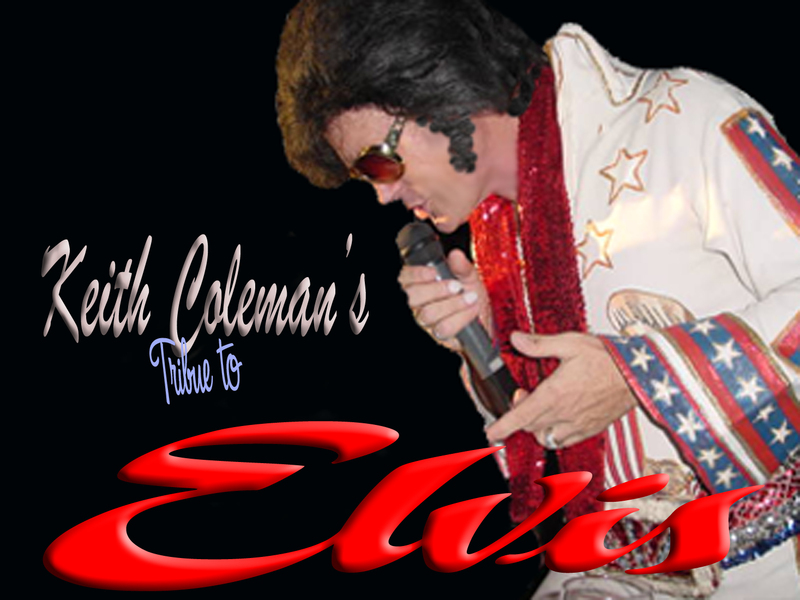 Keith Coleman does over 200 Elvis shows per year. Anything from a Birthday party for 25 people to a corporate event for 5000. How would you like to have Cher come to your birthday party. It can happen. Ruby's tribute to Cher is unbeatable.